I roast just about everything. My favorites are brussel sprouts, asparagus, cauliflower, broccoli, sweet potatoes, green beans, potatoes, summer squash, beets, mixed winter veggies (beets, turnips, sweet potatoes, onions, garlic). I especially like roasting veggies and using them to top a pizza. Oh! What a great idea to top pizza with the roasted veggies. Yummy! Many weeks, I roast a rainbow of veggies on a big old pan with just EVOO and sea salt. I roast them to a little under done, and then put them in serving size containers to take to work for lunch with whatever meat I have left over from the week. The veggies are perfect reheated in the microwave if you under roast them by just a few minutes. Yum. Sometimes I use a ranch (homemade) seasoning mix on top of roasted carrots/broccoli/cauliflower. Yum!!! I love that idea! Thank you so much! I agree parchment paper is much healthier than foil. I’m also a parchment paper convert! And I love the If You Care unbleached parchment paper which is also compostable. Butternut squash! My husband insisted he didn’t like it for the longest time. I roasted some and he was so hungry he tried it and has been hooked ever since. Oh! I’ve not thought of doing butternut squash! Yum! Cabbage! It gets really sweet when roasted and smells more pleasant than when it is cooked. And onions are fabulous roasted too. This is mine and my husbands favorite too!! Zucchini and yellow summer squash. Sweet potatoes. Green beans. Broccoli and cauliflower. Olive oil, a little salt (barely) then garlic powder! Sweet potatoes rounds (almost like fries) like are good with Season-All. Roasted or a salad are about the only ways I eat vegetables. I’ve never tried Sweet Potato Rounds — yum! I love Sweet Potato Fries! Roasted radishes are great too! And almost always affordable ? Ok how do you do the roasted radishes? Have you ever tried doing it with jicama? Roasted asparagus in season. 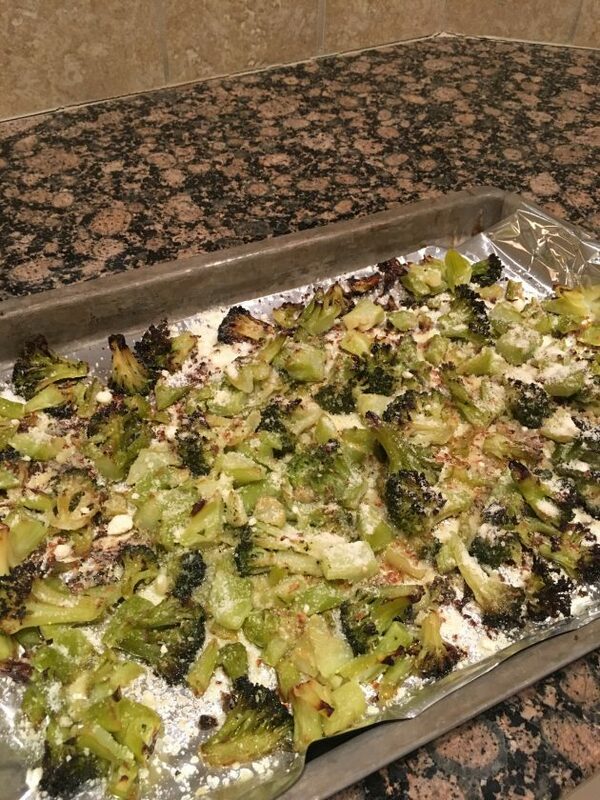 Top with olive oil, salt, and parmesan like your broccoli, then finish with lemon juice when you pull it out of the oven. I found a recipe in a magazine years ago for brussels sprouts (1lb) mixed with 2tbsp EVOO and 2tbsp real maple syrup. Roast at 400F for 10 minutes. Core and cut the sprouts in half. Even my picky child thought they were delicious! We have them at least once a week when sprouts are in season. Okay, now I’m getting hungry! 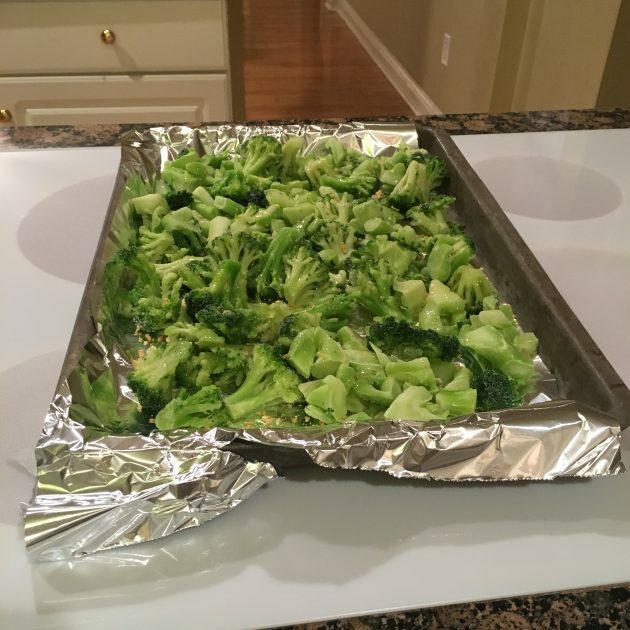 I never thought I would like Brussels sprouts or broccoli, then I tried them roasted! We second the idea of Parmesan cheese on broccoli. I also like to warm pineapple chunks in the oven. They’re slightly better when grilled, but still delicious from the oven! Broccoli is irresistible when roasted with fresh garlic sliced over it. Roasted carrots are another of my family’s favorites. Did you or do you boil veggies first? Or just straight into the oven? They look selfish! No need to boil. 425 oven, liberal olive oil and sea salt. I shake/stir veggies about 10 minutes in and just eye them from there for remaining cooking time. Broccoli is great! I squeeze lemon juice, and Parmesan on mine. I have also steamed broccoli in orange juice, very tasty. I’m going to have to try this! Yum! We love roasted veggies at our house! Many years ago, I purchased a Silpat baking liner and it is great for roasting vegetables. It helps get a nice crispiness to the veggies and they will slide right off the pan. 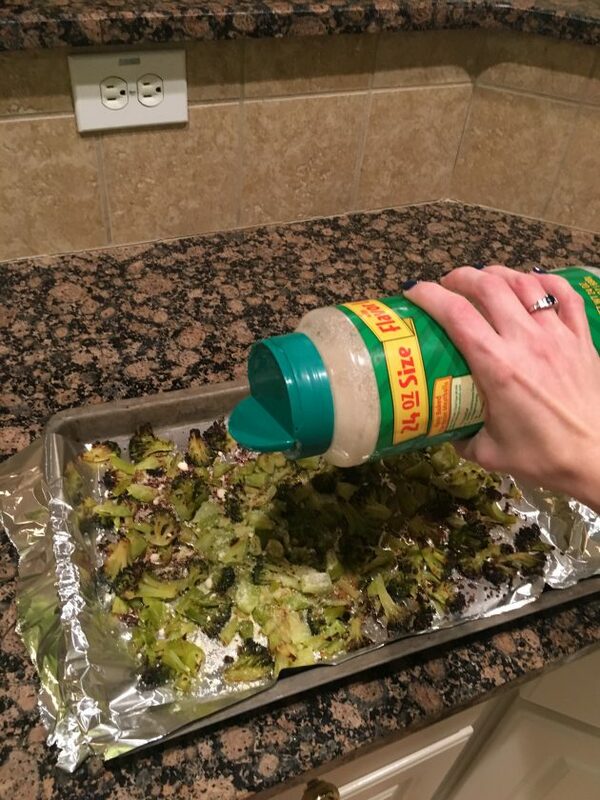 I also like to put some lemon zest over broccoli if I happen to have any on hand. We roast veggies regularly – last night we had those tiny colored potatoes, bell peppers, broccoli, and green beans, with chopped fresh garlic added toward the end. Sometimes we throw some turkey sausage (precooked) in when the garlic is added, and sometimes I fry an egg or two apiece and toss them on top of each person’s plate before serving. Sheet pan meals? That sounds great! Where do you find your recipes? I love one-dish meals. Pintrest has a lot of ideas! me too! the flavor is so much more intense. can’t get enough of cauliflower or butternut squash. we like sprinkled with one of Goya’s Adobo seasonsings right out of the oven as a side or used to make soup or latkes. Oh my goodness, I have loved roasted veggies too. My favorite is to take potatoes and cut into wedges. Add your oil, salt, pepper and chili powder! And you have a healthier french fries! My family loves them!! I love roasted vegetables too!! Some of my favorites are parsnips and swedes in the winter and asparagus in the spring. I roast so many things – broccoli, Brussels sprouts, carrots, red onions, sweet potatoes, red/orange/yellow peppers, cauliflower and potatoes. I have always hated beets, but may have to try roasting them once and see if I have a change of heart. I generally just use a drizzle of olive oil with fresh pepper and Kosher salt. I do put curry powder too on my cauliflower before I roast it. Yum! Did you use frozen broccoli?!?!? That just might be a game changer. 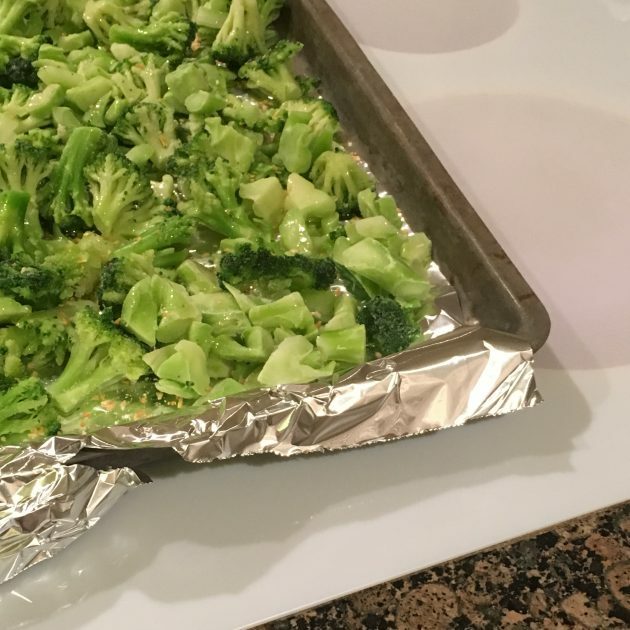 We love roasted vegetables, but I have to roast 4-5 crowns of broccoli to feed my crew. Yes, I use frozen broccoli! Hi. If you are using frozen veggies do you need to defrost and drain them first? Thanks! At what temp and for how long do you roast your veggies? We roast vegetables at least twice a week in our home – we love them. I usually roast a medley of vegetables, that way everyone can pick what the like the most. My kids have different tastes so you can imagine how helpful it is. I posted my favorite roasted vegetable recipe (the sauce is delicious) on my blog – you are welcome to visit and check it out. Purple sweet potatoes, aka Japanese sweet potatoes. So yummy roasted!! Also broccoli, butternut squash, asparagus, potatoes, yellow squash, summer squash. The list is endless.